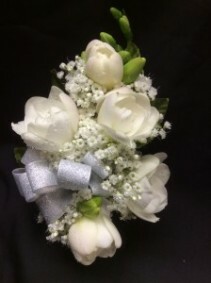 A gorgeous wrist corsage made with Freesia. This lovely flower is also highly scented. Please indicate color of bow you would like. Wrist band is a velcro wrist band. 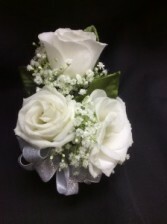 Wrist corsage made with three white spray roses (other colors available) surrounded by baby's breath and greens. A delicate bow gives it a finishing touch. Price includes velcro wrist band. Other band types are available for additional charge. Please call us - we will gladly help you with your order! 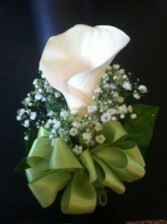 Mini Carnation, baby's breath and greens make up a beautiful, long lasting wrist corsage. Shown in pink - available in different colors. White mini carnations may be tipped with a color for an additional charge. Priced with a velcro wrist band. Other bands (slap band, bracelet band) are available at an additional charge. 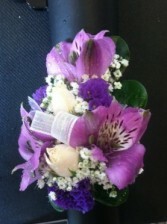 Please call us at 716-648-2110 with preferred color of flower and bow, choice of wrist band and date to pick up corsage. The elegant Calla Lily will beautifully adorn her wrist. Please order 1 week before the event. Otherwise, please call us at 716-648-2110 for availability and color choice of bow. Priced with a velcro wrist band. Other bands are available at an additional charge (slap band, bracelet band). 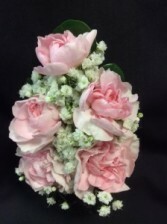 A long stem rose is such a beautiful flower for a wrist corsage. Shown in white - other colors are available. Please call us at 716-648-2110 for color availability and with color choice of bow and date to pick up order. The Alstromeria is a striking flower. It does comes in a variety of colors. Mixed with baby's breath and a bow, it makes a beautiful wrist corsage that's just a little different. Please call us at 716-648-2110 for color choices available. Price shown is with a velcro wrist band. Other bands are available at an additional charge. 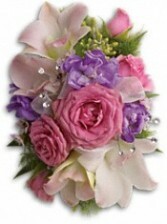 Wrist corsage made with a mix of flowers is so pretty! A variety of flowers and colors are available. 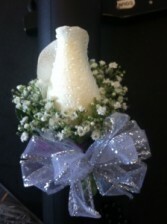 Please call us at 716-648-2110 for choices of flower and bow. Price shown is with a velcro wrist band. Other bands are available at an additional charge.